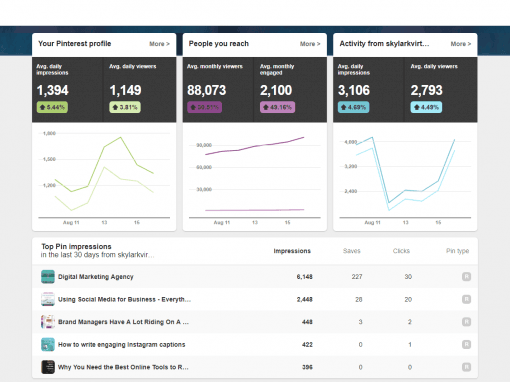 If there’s one thing you can’t ignore when you run an online business, it’s analytics. What works, when it works or why it might not have worked are all key questions if you want to grow your business. 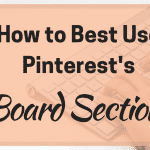 The same applies to Pinterest – you need to know what Pins are working, what is getting clicked and what’s sitting alone and unloved on your boards. That’s when you need to use Pinterest Analytics. 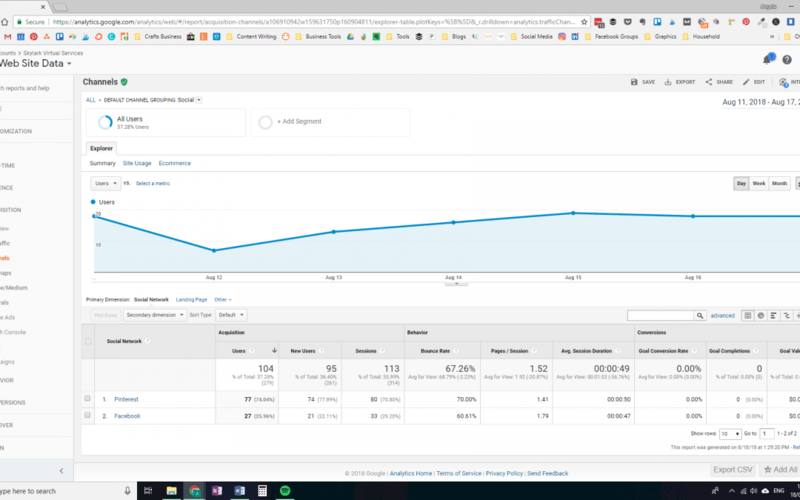 Pinterest Analytics is only available for business accounts but then if you have a website, you should have one of these anyway. 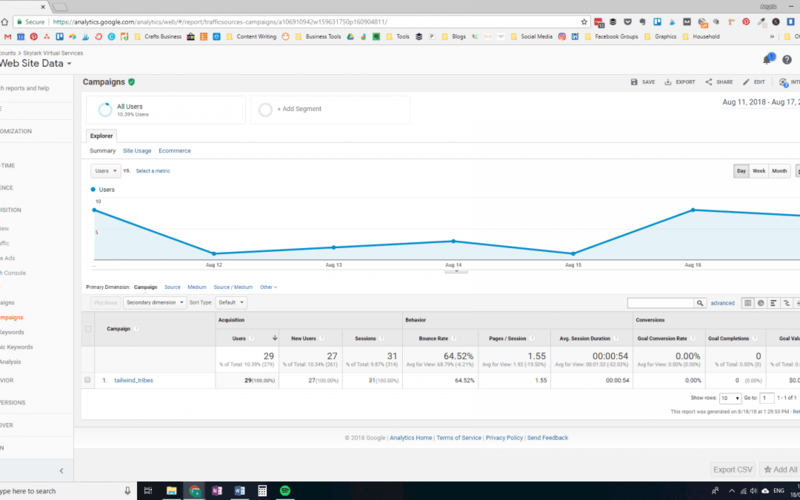 Connecting your website to the account not only lets you use the analytics but opens up things like Rich Pins. Plus it’s the terms of service that if you are a business, you need a business account. Okay, Pinterest, we give in. 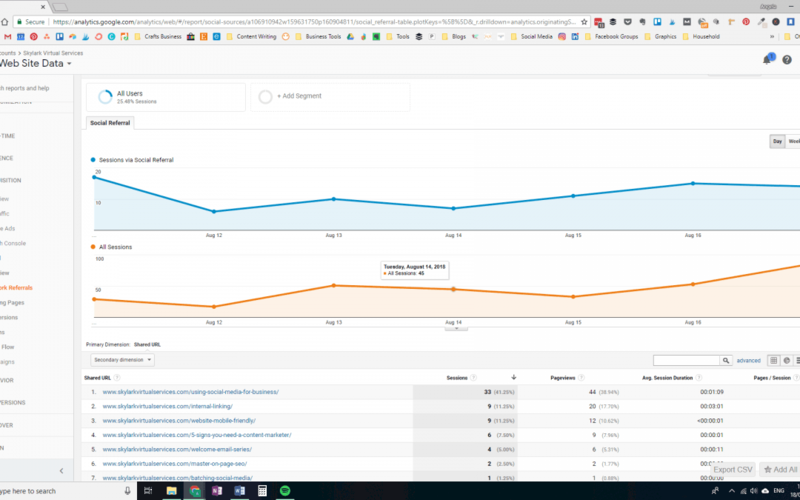 Once you have connected your website to the account it might take around a week for the analytics to really start working. And be warned Pinterest is usually a couple of days behind. And there are sometimes issues, like recently where I had clicks but no impressions – okay, that’s magic then. 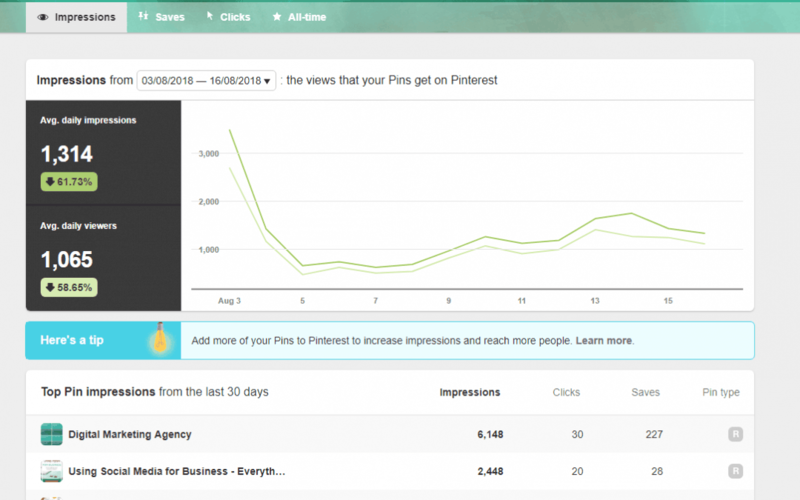 But ultimately, understanding Pinterest analytics is useful but should always be paired with Google Analytics. The Overview does what it sounds like – a snapshot of the other options. Next is profile – this includes all the pins you have pinned from your own website and from other people’s. It can be interesting to see which pins are doing well, where your own pins sit on the list and if there are any boards that are doing particularly well. 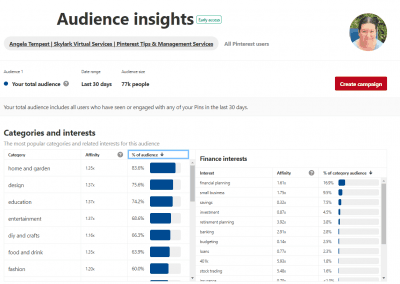 People you reach is now slightly redundant since the introduction of the new Audience Insights. This last option is where you can get an idea of the interests of the people who see your whole profile. It could also be a source of ideas for new boards but more on that another time. The one I use the most is the Website option. Yep, this is your website that you connected to the account and any pins that link to it. That includes ones you pin whether directly or through a tool like Tailwind as well as pins that other people pin from your website to their account. The first option on the website page is the Impressions. These are nice, interesting and show what’s doing okay. Next is Saves (we used to call these repins) which is also interesting. But ultimately, the interesting one is Clicks – these are the ones that are being clicked and sending traffic to your website, the whole point of the process. So while I look at Impressions as a curiosity, it is clicks that I pay the most attention to. Of course, it is often a pattern – more impressions mean move saves and more clicks. Although not always – sometimes people are clicking something without doing anything else with it. That’s a good sign because they are so curious to see your content they don’t even bother to do anything else with the pin! 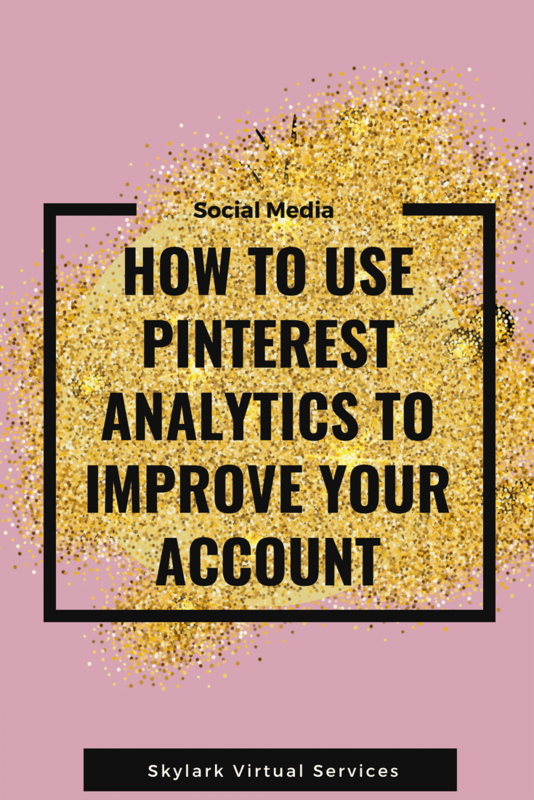 For me, the key to understanding your traffic from Pinterest involve looking both at Pinterest Analytics and also Google Analytics. If you haven’t signed up for GA, go forth now and do it instantly. It is free, it is an industry standard piece of software and there is a ton of useful information on it. 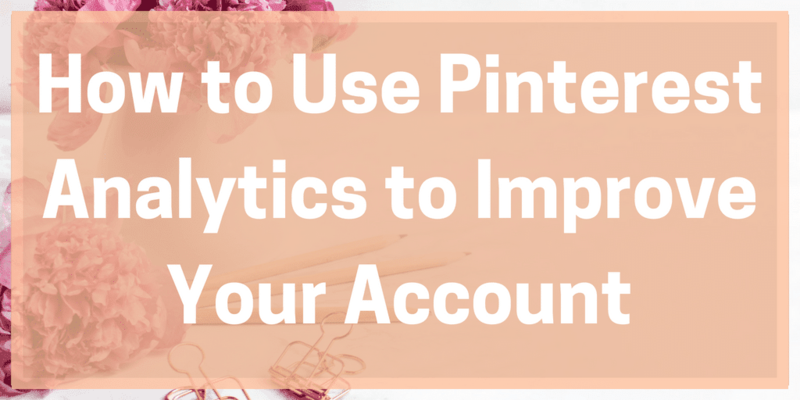 Assuming you are now the proud owner of a GA account, let’s see where some of the data from Pinterest can be found. There are three main places I look to see what’s working from Pinterest. 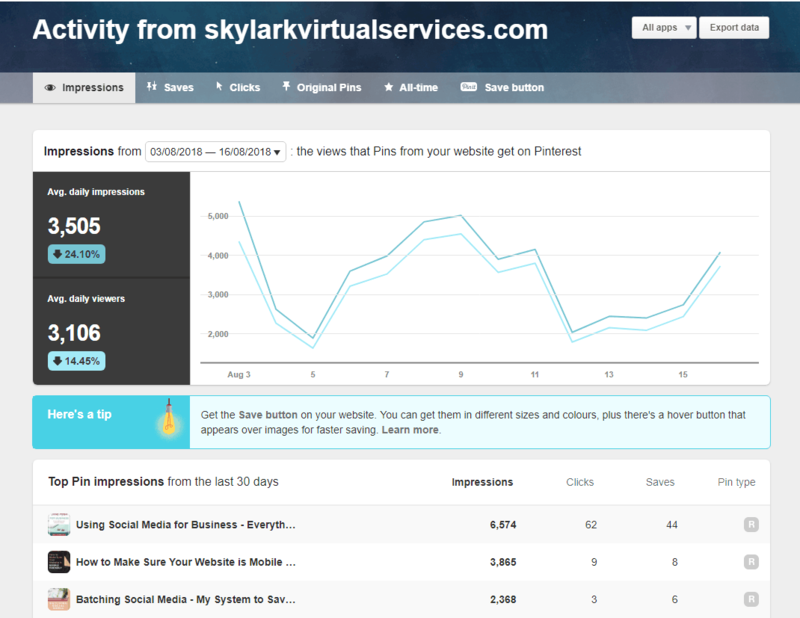 If you click on ‘Social’ you will then see how much traffic has come from Pinterest in the defined period selected at the top (it defaults to a week, but you can change it). 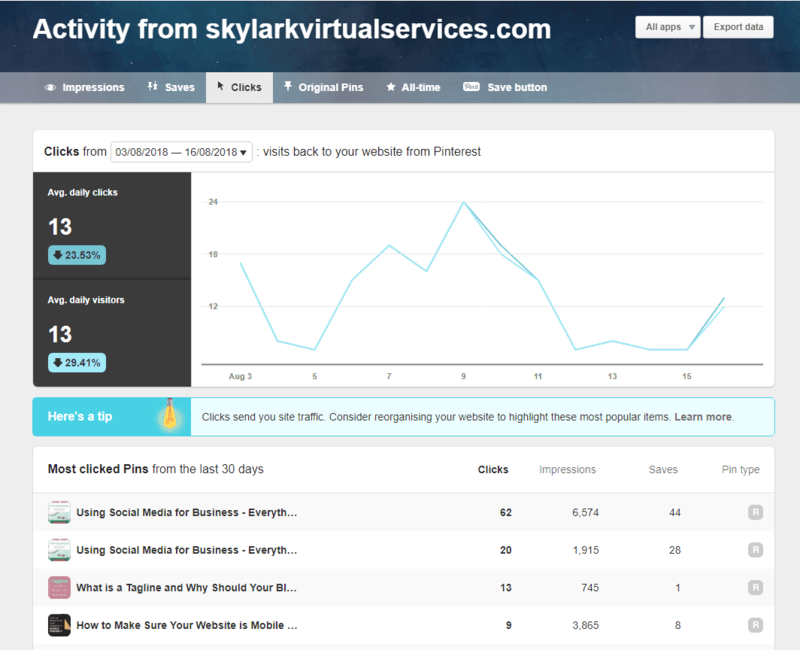 You will also see the likes of Facebook, Twitter and LinkedIn here if you got any traffic from them. This section tells you where you can find which pins are sending traffic to your site. 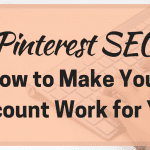 When you click on Pinterest you will see which posts have been the most popular – this can be from multiple pins. If you then click the post, it will give you the URL of each pin and how many people came through from it (it measures sessions, not page views). You can copy and paste this into a browser to see which board this pin is on. This is also how you can find your most popular posts for a particular period. I do this for each month of the year, usually two months ahead. So I’ve just looked at the September ones at the end of July. These are worth creating new pins for because if they were popular last year, there’s a good chance they might be popular again this year. This last one is for anyone using Tailwind and their Tribes. This is where you can see how many sessions have come from Tribes and is worth looking at to see that your efforts are working. Sadly it doesn’t tell you which pins are sending this traffic, but you can get more information on Tailwind itself about this. When I first started blogging, I would check stats all the time because it was amazing to see that people were actually coming to my blog. Now I restrain myself. I might take a quick look at Pinterest each morning to see what the analytics are showing – any spikes? Pin suddenly doing well? Pinterest analytics acting up again? I also have another sheet with the same figures on where I record them once a month on the 1st for the previous month. Do you need to do as much as this? Not if you don’t want to but it can be very handy to watch what is happening, especially if you are running a promoted pin or doing some A/B testing in design or keywords. I’m the first to admit that Pinterest analytics can be a bit of a pain. Of late, there have been more than a few gremlins in the system but when I check Google Analytics, it all makes sense. But it is definitely worth getting acquainted with it, using it and starting to record data so you can make sure every pin counts. 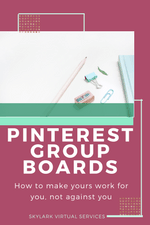 Not sure if your group boards are working for you?